A retail exclusive that showcases distinct patterns, the 2017 Bowman Mega Box Chrome cards are found at Target locations in a special format. Collectors are most excited about the unexpected Shohei Ohtani cards in the set. Each box contains two exclusive Chrome packs along with five 2017 Bowman Baseball packs. 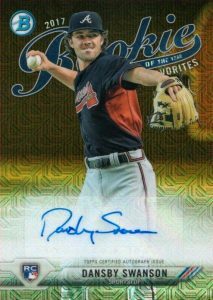 While a final 2017 Bowman Mega Box checklist was never provided, the base Chrome cards appear to largely parallel the Chrome Prospects from the main 2017 Bowman checklist, but with a unique pattern not found anywhere else. There are also a few updates to the list, including a WBC card for Japanese standout Shohei Ohtani (spelled Otani in the set). Joining these are patterned Purple Refractor (#/250), Green Refractor (#/99), Orange Refractor (#/25) and Black Refractor (1/1) parallels. Averaging 1:18 packs or approximately one in every nine boxes, the 2017 Bowman Mega Box Chrome Autograph lineup also features limited parallels with Green Refractor (#/99), Orange Refractor (#/25) and Black Refractor (1/1) editions. While they do cover some of the same names from the Bowman Chrome Prospect Autographs, these signed cards display different images with sticker autographs. In addition, two inserts are carried over from the main product, including Rookie of the Year Favorites and Talent Pipeline trios inserts. Both offer a full assortment of parallels while the ROY inserts feature rare Autographs. 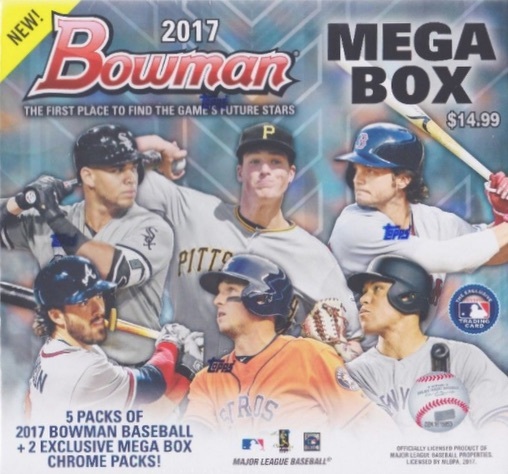 The 2017 Bowman Mega Box Chrome boxes retail for $14.99. They include a $1 coupon for future Bowman pack purchases. The checklist below only pertains to the Mega Box Chrome packs that come two per box. PARALLEL CARDS: Purple Refractor #/250 (1:6 packs), Green Refractor #/99 (1:15), Orange Refractor #/25 (1:56), Black Refractor 1/1 (1:1,396). 1:18 packs. Shop on eBay. PARALLEL CARDS: Green Refractor #/99 (1:82), Orange Refractor #/25 (1:274), Black Refractor 1/1 (1:6,838). 1:4 packs. Shop on eBay. PARALLEL CARDS: Purple Refractor #/250 (1:28 packs), Green Refractor #/99 (1:71), Orange Refractor #/25 (1:280), Black Refractor 1/1 (1:6,979). Serial numbered #/75. 1:122 packs. Shop on eBay. PARALLEL CARDS: Orange Refractor #/25 (1:365), Black Refractor 1/1 (1:9,117). 1:2 packs. Shop on eBay. PARALLEL CARDS: Purple Refractor #/250 (1:19), Green Refractor #/99 (1:47), Orange Refractor #/25 (1:187), Black Refractor 1/1 (1:4,653). I have purchased a few of these. The look really nice. Great to have the Shohei Otani card in it. I also saw a difference with card BCP141 the name is spelled Hyun-Jong Yang. In the base set it is spelled Yang Hyeon-Jong. 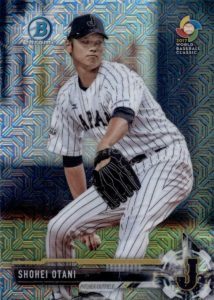 First Shohei Otani card will make this popular for years to come! Buy these up……you can’t go wrong. So far So Good. Bought 5 of these boxes. Out of the 5 boxes (10 mega packs) I hit 1 auto, 1 insert refractor, and 2 base refractors. No super huge names – but should be able to get a good chunk of my money back plus have a lot of the base set started. Love that the Otani card is really driving up the secondary market on these too. A rising tide floats all boats. Plus Judge and Bellinger. This stuff is hot. Where are you finding these boxes? Something fishy about this product. Target stores in my area received 3-5 boxes per store when it initially released. However, they never received anymore even after 5 weeks after. That seems odd to me, giving that excell marketing always restocks every week for awhile of new product. I check with my local store everyday and the stock guy comes in on Fridays and he told jewelry he doesn’t have anymore boxes. Based on my numbers their are purple #250, green #99, black #25 and 1/1 ‘s for each base card 1-150. 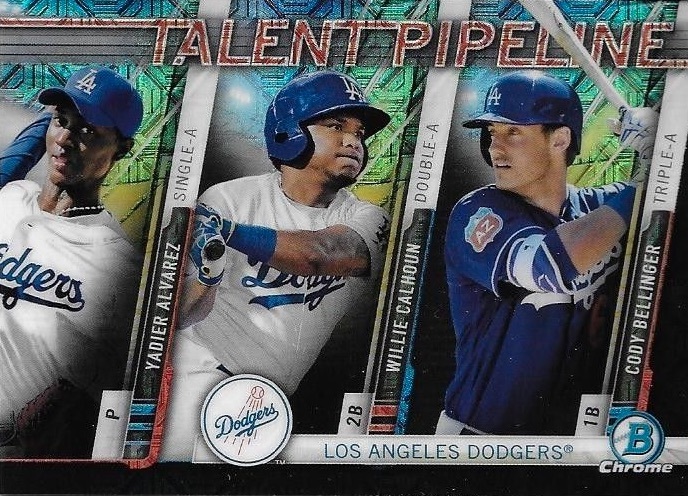 There is also the talent pipeline insert set and rookie of the year set that also have the numbered color versions. Just with purple that is 44,850 purple refractors of each card. These show up at about 1-2 per 3 boxes. Adding just the purple base cards up is 89,700 boxes at 1-2 box odds. According to the Internet there is just over 1,800 target stores in the usa. Doing the math that should be 49.83 boxes per store and that just with the purple refractors?. These boxes retailed for 14.99 and now are getting well over a hundred dollars a box. I also see main hobby Internet power selling companies are selling these boxes now. It’s like they just released a little bit to the target stores to get the interest up and then sold the product off the channel. I don’t how or why topps did this product for target, but sadly almost everybody got shut out on this product and that isn’t right. Yeah, you can buy a box. Expect to pay well over 100.00 for it. I have thought about calling excell marketing headquarters and asking them where all this product went. Surely, the majority of it did not make it to the target stores. Kinda, leaves a bad taste in your mouth. I have not seen about 50 or so of the base cards. Does anyone know if this is a skip numbered set of approx. 100 cards or is it just that the rest of them were never distributed? Dave S: There are certainly some gaps. I was able to verify exactly 100. The scoop in a New York suburb. There’s 4 Target locations with in 10 miles. 1 of which is right by my work. wLked in last night and saw the set. I bought one for 15 bucks. Came home split the package and said I got to go back. When back The following morning. And purchased the remaining 7 of 8, contained in a case unloaded at my target store. Wade: The supply of Bowman Mega Boxes was held up by Topps for a few months to address some issues, and now boxes are returning to Target locations around the country. Many collectors should be able to find them in stores now. Found my first 2 of these yesterday in Langhorne PA so still out there. I have pulled 3 of the Rookie of the Year Favorites so far. All of them have a black background but are not serial numbered. Any word on whats up with these? Are these the 1/1’s? A dozen boxes this AM at Lawrenceville NJ, hesitant to sit on them but want to save for a rainy day lol. Love this product! I hate the price hiking that has doubled the price online. It’s a great $15 box for my boys to open with great potential for big hits. Love the limited Pipeline and Rookies Inserts. So it this set 100 cards or 150? Beckett shows 150, with prices, but checklist here has changed. Ex. is there a Gavin Lux? #2 card, beckett shows a price on that card. Kevin: Our 100-card list shows what could be confirmed since Topps never issued a checklist. I have never seen a card for Lux so not sure where that pricing would come from. Please let us know if you see something the differs from our base set. Can someone tell me if the green mega autographs of Collins, Maitan, Moniak and Senzel exist? I have never seen them come up on ebay and Beckett doesn’t show any of these to have ever been graded. Also, the blue mega autos of Ibanez, Morejon, Rodriguez, Mundell, Hu, Mejia, Armenteros and Keller don’t seem to exist either. Anyone seen these out there? This reply is to Mike S. asking about the Mega autographs of certain players. 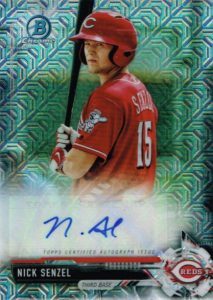 I can confirm that I did see a Nick Senzel Green auto listed on eBay for $325.00 yesterday. I have not seen any of the other players you asked about though other than their base cards or refractors. Thanks. Tony: I appreciate the reply. Is there any way you could give me the ebay auction number for that green Senzel auto? All I can find are green shipper and green chrome auto’s. Thanks! 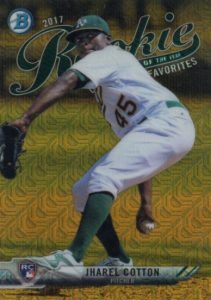 BCP-46 is Dakota Chalmers from the Oakland A’s. Just pulled him from a pack of these cards & noticed he’s not in the Checklist. Thanks. BCP-34 is Pitcher Yeudy Garcia from the Pittsburgh Pirates. BCP-98 is Pitcher Tomoyuki Sugano from Team Japan(World Baseball Classic card). BCP-5 is Pitcher Mike Soroka from the Atlanta Braves. BCP-120 is OF Harold Ramirez from the Toronto Blue Jays. Hello Trey. This is the checklist section for the 2017 Bowman Mega Box cards. That’s the exact cards that I provided from the reply above. It’s the cards that came out of my purchased Mega Box from eBay. It’s the 5 regular Bowman Packs + 2 Exclusive Chrome Packs so yes it’s this particular checklist that the cards would pertain to Trey. Keep in mind, not all of the ones I listed are from the 2 Chrome Packs & are base Bowman cards only pulled from the regular Bowman 5 Packs. I think a couple cards I listed though are actual Chrome cards pulled out of the 2 Chrome Packs. These are definitely the cards Trey. The ones I provided aren’t listed from the above checklist so since this is the exact Mega Box then they have to be for this set. Thanks. This checklist only applies to the Mega Box cards, not the base Bowman packs that come with it. I don’t see any cards you mentioned in this exclusive format which is why they aren’t in the checklist. Hello Trey. So, this particular checklist here is strictly only for the 2 Chrome Packs that comes in the Mega Boxes? If that’s the case in my opinion this needs to be noted somewhere. I mean the 5 Bowman packs do have Chrome cards in them too so they’re not just all base Bowman cards in those packs from these Mega Boxes. Going by what you are saying then the cards I listed that I thought were missing from the checklist here should be in the regular 2017 Bowman base cards checklist. Is that basically what you are saying? Like I said, I believe 2 of them I listed from the actual 5 Bowman regular packs were Chrome cards so that would qualify those cards to be in the checklist here & not in regular Bowman checklist since these are from the Chrome Mega Box. Hope I didn’t confuse you too much Trey. LOL! Thanks again. Correct. This is only for the Mega Box Chrome exclusive cards with the pattern “mojo” background. We are certainly not trying to confuse anyone. The regular packs are just from the normal Bowman checklist, even if they are Chrome parallels. They key thing is the exclusive pattern background. Only these cards are listed here. Thanks for the confirmation Trey. Have a blessed rest of the week & also thanks for everything you do & provide here at cardboard connection. 2017 Bowman Mega Box Sealed Chrome Target Exclusive Refractors Acuna Otani? 2017 BOWMAN MEGA BOX FACTORY SEALED Box - Ohtani? Bellinger? Judge? 2017 BOWMAN MEGA BOX 16 BOXES SEALED CASE (OHTANI, ACUNA, GUERRERO JIMENEZ)!!! !